Reallusion released the newest version of its CrazyTalk software during December 2015 and I was fortunate enough to get my hands on a free copy CrazyTalk 8 Pipeline version after buying a truckload of Reallusion content in order to get the special deal. If you're not familiar with CrazyTalk it's basically specialized software for creating and animating talking heads quickly. CrazyTalk 8 extends the original capability of creating a semi 3D head from a 2D image to creating true 3D heads that can be imported into iClone and Reallusion's new 3D Character Creator (Pipeline version only). 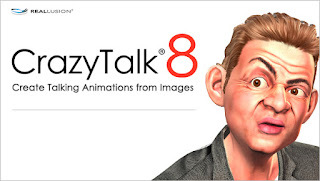 Since the original function of creating a talking head from a 2D image is pretty much the same as CrazyTalk 7 I'll be focusing on the new to CrazyTalk 8 function of creating and animating a true 3D head/talking avatar. For a quick overview of this function watch the video below. With anything that lets you create any kind of custom character my go to project is to try and create an avatar of myself. So that's exactly what I did. 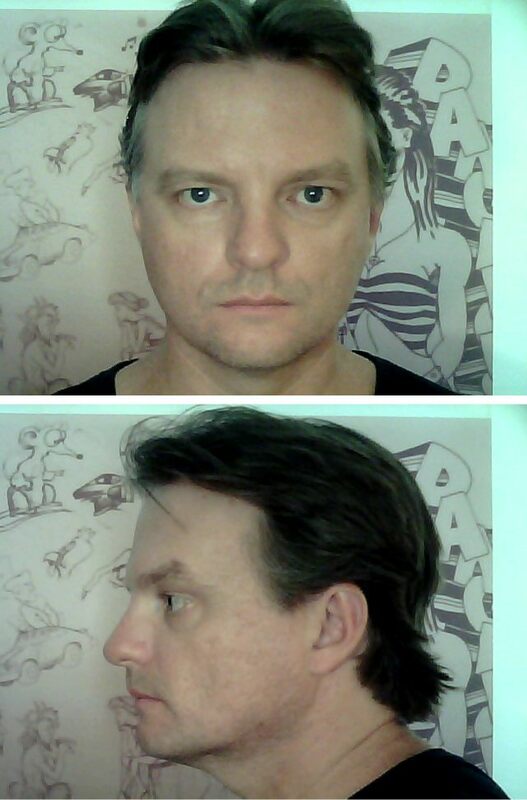 I didn't have any suitable images ready to go so I took a front and side image of my head using my webcam in the recommended poses. Unfortunately my webcam is only low-res suitable for video calls so I attempted to scale up my images using PhotoZoom Classic 6, software that is supposed to be able to scale up low-res images so they still look good and don't pixelate. It did a fairly okay job but I have no doubt you'd get better results using actual high res photos. From there I opened CrazyTalk 8, started a new 3D character project and began running through the step by step instructions. Prior to this I had run through all of Reallusion's video tutorials on the new functions. You don't really need to do this as everything is really clear and handled in a logical way. However you will pick up many tips for how to improve your characters and learn how to drill down into the less obvious settings of the software once you've completed your initial character. Constructing my 3D TET head in CT8. 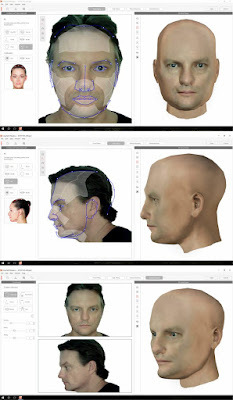 The majority of the process is simply placing and adjusting points on your two photos so that the program can generate a 3D version of that image (minus hair). I won't detail the process suffice to say it wasn't hard and I thought I came up with a reasonable likeness after quite a bit of tweaking of points. Once you have your bald, shirtless character the next thing you'll want to do is replace the eyes. You can get by with the eyes from your photo but they won't look right almost as soon as the character starts moving its eyeballs around. Time to substitute with some template eyes. 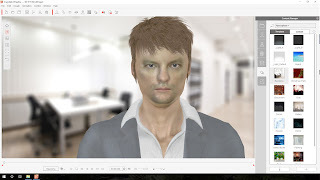 For some reason, all of the realistic human eyes in CrazyTalk 8 content appear very bloodshot and red. I added in template blue eyes and it look like my avatar had spent a very rough night on the town. I tried adjusting the brightness and contrast but the eyes still looked terrible. In the end I saved out my eye texture and removed much of the bloodshot lines and lightened up the eyeball white considerably. A don't know about Reallusion's staff and how much sleep they must get to include eye templates so blood shot but a few clearer eyes would be nice. After that it was time to choose some hair and clothes. Again I don't know about Reallusion's staff but how about some hair and clothes in the included content that people actually wear in the real world? looked like me with the included content. All the male hairstyles included seem like they were modeled from teens, surfers or hipsters and looked ridiculous on my 45 year old avatar head. I can't tell you how disappointing it is to get a really good likeness of the head only to have it ruined by a hair style that isn't even close to my own even though I've tried to find one that kind of looks like my hair. Same goes for the included clothes. Most outfits for the males are things that look like stuff my grandfather would wear or are better suited to surfers and hipsters. I had better luck recoloring a suit to be more like the TET Avatar I usually create but some regular business suits or even just a normal dress shirt would be nice. To resolve the issues with the lack of male hair styles and clothes I did buy Reallusion's Party Fun and Dress Up Showtime Packs but I don't think these were worth the US$109.00 I paid for them given how few new male hair styles and clothes they added in a style that I could actually use. Come on Reallusion, where's the regular every day people packs for males and females? How often am I really going to need springy star head bands and clown noses in my talking head animations? Are all these Cos-Play accessories and clothing items really in high demand? appearance was much closer to what I wanted. Those complaints aside, with the new content packs I was able to get much closer to my TET Avatar (that always wears circle specs) than before. CrazyTalk 8 has predefined atmosphere templates that give your character specific lighting and weather conditions. With limited physics options that can add a little more realism such as having your character's hair blowing in the breeze. It's easy enough to mix and match the atmospheres up by simply choosing the atmosphere you want and then changing the background to one of those from another atmosphere template or you can even upload your own. Getting your Avatar's to talk is pretty straight forward. You can record directly into the software or upload an audio file. The lip syncing will happen automatically. For the most part it's pretty good but you can tweak it through the timeline if things are a bit off in places. Animating is also a breeze. You can use predefined motions or manually puppet the character if you wish. My first test animation below uses only the auto-talk animation motions. I've no doubt I could improve upon this with a little more tweaking and a few more layers of motion on the timeline. Once you're done export the animation into one of several video formats and use it as you wish in your own productions. Like Reallusion's other flagship products (iClone and CrazyTalk Animator 2) CrazyTalk 8 isn't intended as a complete animation tool. You'll need to import your finished sequences into a video editor if you want to add further elements like titles, transitions and other stuff. 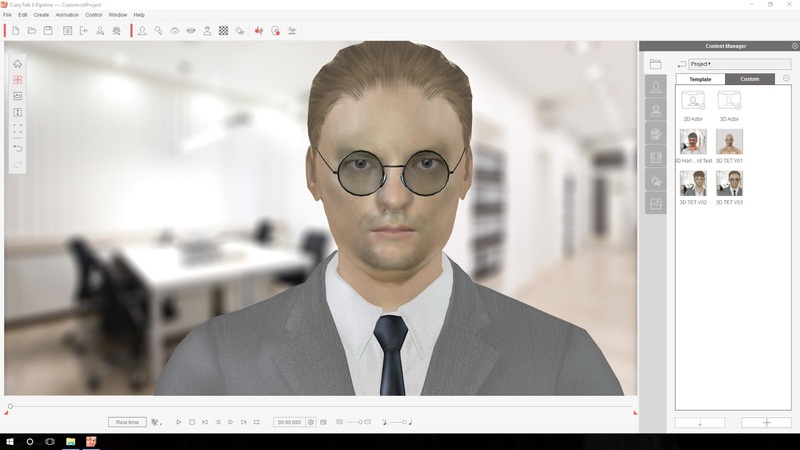 An added bonus of purchasing the Pipeline version of CrazyTalk 8 is the ability to export your 3D heads into iClone or Reallusion's 3D Character Creator. In general CT8 is a much easier environment to design heads in as opposed to doing the same directly in those other two packages. It's a good way to start a character before exporting it and refining it further. It also gives you the option of giving your characters a full 3D body in iClone if you really want to expand from just animating the head. Over all I really like CrazyTalk 8's ease of use. It does a pretty good job of producing realistic looking heads as well as caricature heads if satire is more you thing. If you already have CrazyTalk Animator 2 then you can get by without the 2D avatar creation tools of CT8. If you already have iClone and/or Reallusion's 3D Character Creator then you could also get by without CT8's 3D head creation tools. However if you do a lot of talking head style animations then this is certainly the better tool to use as it's simpler whilst still being very versatile. I can certainly see myself experimenting with it and using it a lot more as a starting point for character designs. I particularly want to try more comic style avatars rather than the realistic heads that I've demonstrated here. Hi David - thanks for this. I found it very useful, especially the analysis in your second-to-last paragraph. Glad you found this review helpful. If you haven't read it already, I wrote a later article on creating a more illustrative style 3D head and went through the process of transferring it from CT8 to iClone6. Read it Here. Thank you! Need to get iClone6, clearly. I have come up against a thorny little problem though. From the time you did your head, how did you get to the body stage, or didn't you do that in Crazytalk8? I see the Actor Styles icon isn't visible when I have my custom head, only when I switch to one of their models in the library. Somehow I thought it would be a bit easier to get a body on him. Or did you add a body via some other software? V puzzled. CrazyTalk will only allow you to add a neck and shoulders to your character (no arms or hands though). It's specifically a 'talking heads' animation software. Once you complete the head it is automatically placed on a body. At which point you can add clothes etc. Actor styles should still work with your custom head once you've finished setting it up, though I tend to just go through all the content folders and pick and chose the things I want. So far here is my problem with Reallusion. The product is absolutely fine with a very notable exception. First of all, I ordered CT8 "Pipeline". That term "Pipeline", as Reallusion defines it, means that you can export assets that you create to other applications. So I purchase a CT8 pipeline package that included Realistic 100 Human (heads) thinking, ok I can create in CT8 and export to my favorite apps. Wrong! First the $189 package doesn't include export rights for the content, that's another $50,which I did purchase. Next, no way to export the content unless you have Content Creator with "pipeline" which you later find out is only done if you buy IClone with "pipeline" for another $380 minimum while it is on sale. So in short. These guys have a great product but who ever is in charge of sales and explaining to the public how all the pieces fit together are killing its viability. I bought CT7 and then this product but it'll be my last if they don't correct the issues here. In short if you do not use Iclone with "Pipeline", don't bother with this product unless all you need is to use it from within CT8. I sometimes think people don't do adequate research on products before they buy them. When I purchased CT8 (Pipeline) I knew you could export the 3D heads to iClone only and that you'd need Character Creator to do it. Character Creator is a free bonus you receive with all versions of iClone. Usually if you want to export iClone content to other apps you need 3DXchange (pipeline) to do it and need to purchase an additional license for the content to be used in non-Reallusion apps if you haven't already paid an export license. All of this information is on their site and, when you buy content, you are usually given two license options iContent or Export (Choose Export if you don't want to pay additional license fees on your content when exporting to other apps).